2. On this Saturday, there were early celebrations of the Workers Party’s anniversary, which tomorrow marks 39 years since its founding. In different demonstrations held in Brazil and abroad, activists from across Brazil remembered President Lula and his condition as political prisoner, victim of arbitrary processes that were contaminated by the political and ideological positions of judges who are merely supposed to follow the law. In São Paulo, for example, the Bank Workers Union Hall was packed with activists who, synchronized with the Lula Livre Vigil in Curitiba, yelled good afternoon to the former President. 4. Today in the Lula Livre Vigil in Curitiba, the journalist and writer Nicodemos Sena, architect and lawyer Maril Perim, from PT Tabuaté (São Paulo), the popular educator Geraldo Pastana and teacher Maria Antônia (Toninha) from PT Belterra (Pará) facilitated a conversation circle on the theme of “Lessons from the struggle for the current moment”. With participation of activists from caravans that arrived from Florianopolis and the Baixada Santista, the conversation circle was lively and divided into discussion groups. 5. 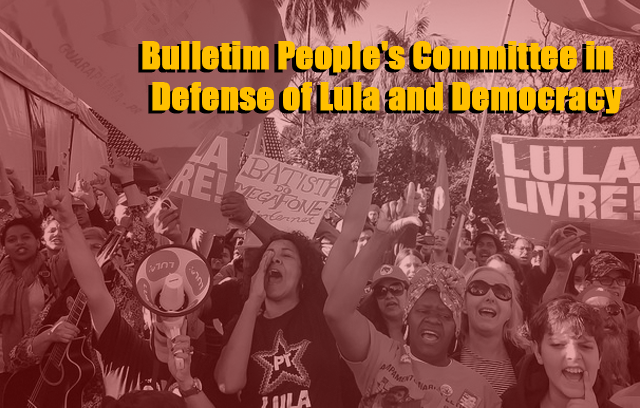 The good morning and good afternoon shouts to President Lula on this Saturday featured the participation of activists who arrived in bus caravans from Florianopolis and the Baixada Santista and women from the UBM (the Brazilian Woman’s Union). During both demonstrations, activists emphasized the importance of increasing the movement for freedom for the ex-President, and reminded everyone that he has been a political prisoner since April 7, 2018, victim of the greatest judicial persecution in Brazilian history, in trials in which the judges violated the laws and the Constitution without the minimum concern.